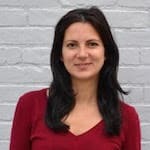 Jona Repishti is the global network manager for the International Development Innovation Network (IDIN) based at MIT D-Lab. Repishti supports the IDIN network of more than 800 innovators around the world by with opportunities for ongoing co-creation, resource sharing, mentoring, and funding. Repishti also manages the D-Lab Scale-Ups Fellowship program for social entrepreneurs. Prior to D-Lab, Repishti worked for the United Nations and other agencies, taking part in short projects in Haiti, Kenya, Kosovo, and China. One of her proudest achievements is founding the Mjaft! (Enough!) Foundation promoting youth civic engagement in her home country, Albania. Repishti holds a BA in International Relations from Middlebury College and an MPA in Development Studies from Princeton University. In her free time she stays active in the Albanian diaspora, reads the New Yorker, and tinkers with vegan recipes. This post, which addresses a recent effort to share what works and doesn't work in bringing market-driven solutions to base-of-the-pyramid customers, was the most popular NextBillion article in September. That earned it a place in our annual Most Influential Post contest. You can vote for it, or any of the other 11 contenders, through Jan. 2. The winner will be announced on Jan. 4.